It was another beautiful weekend for fishing on the Sunshine Coast. We had full day charters on Saturday and Sunday and fished the outer reefs. And there was plenty of action to keep everyone happy. 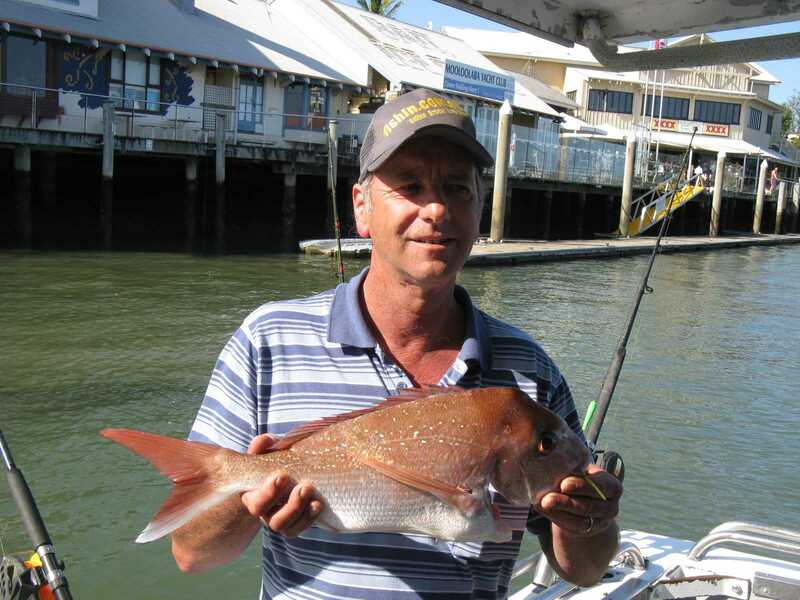 On Saturday we targeted the bottom fish at Caloundra Wide. We trolled a lure on the way out and picked up a little tuna, which made for good strip baits. And we reeled in some great catches, including snapper, pearl perch, tusk fish, gold spot wrasse and fusilier. Everyone was kept very busy through the day with lots of under size fish on the chew. Despite that, they all managed to catch a few keepers, mostly weighing in between 1 and 2kg. Wally’s tusk fish and Pete’s snapper were the biggest of the day weighing 2.5kg and they are both excellent eating fish. Nice work guys. We changed tactics on Sunday and headed a bit further north in search of bigger sized fish and some more colourful ones as well. In the middle section of the Barwon Banks, in fairly shallow water (32 to 40m), we had some success. The colourful fish were definitely on the bite and we caught red throat emperor, southern fusilier, gold spot wrasse, venus tusk fish and moses perch – a pretty good haul I think. But the day wasn’t over and we went out a bit deeper, into 80 metres, searching for pearl perch and snapper. The day was nearly over when the excitement started. We hooked a monster – a wahoo weighing a whopping 30kg. This beauty was caught while trolling a Halco swimmer. Congratulations to Isaac, the lucky punter who wound it in – again and again. Every time we got it to the boat it would take another screaming run. Eventually we got it in the boat and most customers said it was the biggest fish they had seen. Wahoo steaks for all. You might remember we caught a wahoo a few weeks back. They will get more and more abundant as it continues to warm up, along with other pelagics like mahi mahi, tuna and mackerel. Fun times. If you would like to try your luck at catching one of these, head to our Contact Us page and send us a message or give us a call. We’d love to have you on board.